Tracksounds: James Cameron's Avatar - Don't Forget the Music! 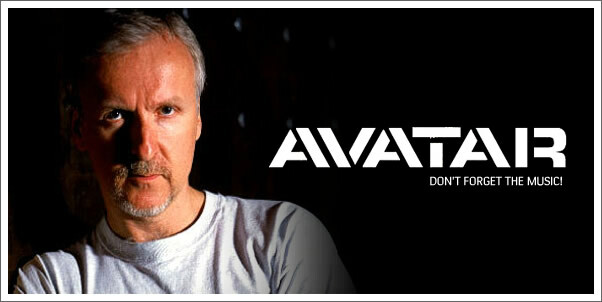 James Cameron's Avatar - Don't Forget the Music! You may have heard of Ain't it Cool's recent interview with director Jon Favreau regarding his reaction to the pieces of AVATAR he was able to see. In short, he said that James Cameron's film and the visual techniques being employed to pull it off are "the future." It seems that any of those who have caught even the smallest vestige of the film are equally impressed. The way AVATAR is being guarded, I hope all of the privileged are right about this. It's certainly time for "something big" to happen in the industry again. In my life, there have only been a handful of films that truly "changed the game" - forcing the process of film-making to it's next evolutionary step. There was 2001: A Space Odyssey (which really pre-dates me by 1 year, but I have to include it), Star Wars, The Matrix, and The Lord of the Rings Trilogy. In every case, there was someone behind the film who was obviously a visionary, but not just that. They were compulsive, detail-oriented, visionaries, who bleed into every facet of the film. In the end, it's this very thing that helps to give each of these film's their "re-watchability." All the blood, sweat and tears of these directors and their production teams, ooze out of the film, making their created world believable - believable enough to want to journey back to it over and over again even though we know how the story is going to play out. Given Favreau's description of segments of AVATAR that he has seen and his perception of director James Cameron, this could be cause for great hope that yet another step in sci-fi/fantasy/action film making may be coming. (Oh - and one other film that could be added to that list above would be James Cameron's own TITANIC). So with all the time and effort Cameron has been taking on his first major effort since the '97 blockbuster, perhaps we'll be privy ourselves to that "next step in film-making." Visual techniques and technologies are, of course, all wonderful, but certainly not enough to make AVATAR great. Without a solid story, writing, and acting, AVATAR, like any of these others mentioned, will be D.O.A. Assuming that AVATAR also has these ingredients as well, there remains still one more vital facet of the film that must be given equal attention to. From my clearly biased opinion on the importance of a film's score, it could prove to be a disaster if James Cameron and reportedly, composer James Horner, do not nail the musical score for AVATAR. Anyone would be remiss to disregard the impact of the musical scores from each of these evolutionary films of the last 30 years. Whether it was Kubrik's use Johann and Richard Strauss or the Wachowski's employment of electronica tracks by Rob D or The Propellerheads or Don Davis' post-modern magic, (need I even mention John Williams' music for Star wars?) without successful music composition and supervision it's a tough bet that AVATAR will join these other iconic milestone's in film. We have less than a year to wait before AVATAR hits theaters in 2009 - that is, of course, if it is not pushed back again. If it proves to be true that JAMES HORNER is writing the score, then we at least know that he has had plenty of time to mull over plenty of musical ideas. While I have some reservations, I am looking forward to what this film might turn out to be. I hope, come May 2009, we also have another film-music classic that pushes that medium to its own "next level" and fuels discussions for years.